Did US promise ‘economic rewards’ to NK? US Secretary of State Mike Pompeo’s mention of “prosperity” for North Korea if it ends its nuclear weapons programs may hint at economic rewards for the cash-strapped regime. Pompeo said Friday that his talks with Kim Jong-un in Pyongyang had been “warm,” “constructive” and “good,” and he made clear that if North Korea dismantles its nuclear weapons in a permanent and verifiable way, the US would be willing to help boost the North’s economy. “If North Korea takes bold action to quickly denuclearize, the United States is prepared to work with North Korea to achieve prosperity on the par with our South Korean friends,” he said at a news conference with Foreign Minister Kang Kyung-wha. 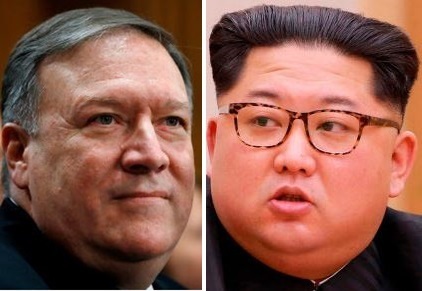 Pompeo went to Pyongyang on Wednesday in his second trip in as many months, to finalize plans for the upcoming US-North Korea summit and bring back three Americans who had been detained in North Korea. As such, expectations are growing that the two countries are nearing an agreement on ways to achieve denuclearization and to guarantee the Kim Jong-un regime’s security ahead of their historic summit set for June 12 in Singapore. Since US President Donald Trump accepted an offer of direct talks with North Korea, there have been concerns over whether the countries have the same understanding of what denuclearization means and how to achieve it. Washington demands Pyongyang denuclearize in a permanent, verifiable and irreversible manner in a short period of time, while Pyongyang demands Washington guarantee its security and take “progressive and synchronous” steps in return. One of the “progressive and synchronous” steps was thought to be the easing of international sanctions that have throttled the North’s trade -- including coal, iron, seafood and textiles exports -- and limited its imports of crude oil. North Korea might have agreed to a rapid dismantlement of its nuclear and missile programs, and the US might have agreed to partially easing sanctions against the North in return, some analysts say. “I think the US and North Korea have already reached a certain level of agreement,” said Kim Dong-yub, a professor at Kyungnam University’s Far East Institute. He also pointed out that sanctions relief could come as a first step as early as this year, as both leaders could use the political achievement. Trump is facing midterm elections and Kim needs to bring tangible results in boosting its economy with his 2016-2021 economic plan in place. “The deadline would be 2020 for both countries, before the US holds its next presidential election and North Korea completes its five-year economic plan,” he said. The very reason the North is seeking to bolster the economy is to appeal to its own people -- a key to regime survival -- after having declared itself a nuclear weapons state last year, according to the scholar. North Korea announced at a ruling party meeting last month that it was suspending all nuclear and missile tests, as well as a plan to close the nuclear testing ground, saying that the weapons development programs’ goals have been achieved. It said it will instead “concentrate all efforts of the whole party and country on the socialist economic construction,” which analysts have said may mark an end to the “byungjin” policy of pursuing the parallel development of nuclear weapons and its economy. Another expert was doubtful about the prospects of North Korea’s complete dismantling of nuclear programs, but agreed that the US might have economic rewards for North Korea in mind to quicken the North’s denuclearization process. “I think Pompeo talks about economic assistance in return for North Korea getting rid of its nuclear weapons programs in the short term. For starters, it would not be a blunt economic assistance, but would be a partial, limited sanctions relief,” said Ko Myong-hyun, a researcher at the Asan Institute for Policy Studies. “The North will not abandon its nuclear arsenal, but it will seek to reduce the amount of its nuclear weapons in return for some economic benefits,” he said. He said that Kim would want sanctions relief as well as economic assistance and foreign investment in its infrastructure to directly benefit the regime, not its people.